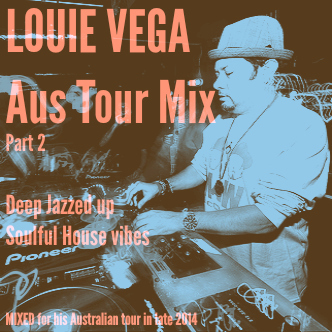 Monday Mix: Louie Vega – 2014 Aus Tour Warmup Mix – Pt 2 – | Deep Jazzed Up Soulful House Vibes | SOUL OF SYDNEY FEEL-GOOD FUNK SOUL DISCO vibes & beyond. The legendary Louie Vega warming things up ahead of his Australian Tour back in 2014. Style: Deep House with a whole lotta’ SOUL. ← NEW SYDNEY MUSIC: YUM YUM feat. The Brass Knuckle Brass Band – Do you Really?